I am such a sucker for fall. I like summer, I really do, promise! However, Georgia weather is crazy and usually I am so sick of the heat and humidity that I welcome autumn with open arms. And HELLO? 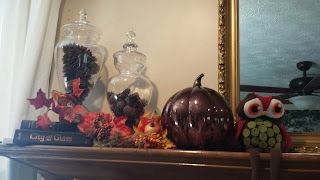 It is the best season for decorating and pumpkin yumminess! Everyday we are celebrating here at the Primary Peach! Yahoo! Make sure to scroll to the bottom of this post for a chance to enter a $50 gift card to Amazon or TpT (your choice!). I think my most favorite thing about the fall is PRODUCTIVITY. I am all wilty like the flowers on my back porch by the end of September. Then, October rushes in and I get a breath of cool, productive air. I like to bake in the fall. My most favorite EASY and yummy recipe are these pumpkin muffins. It is just a can of pumpkin, spice cake mix, and I cheated and added a bag of chocolate chips. MMMM. I baked them according to the directions on the back of the cake mix and BOOM! So good! I also like to decorate in the fall. 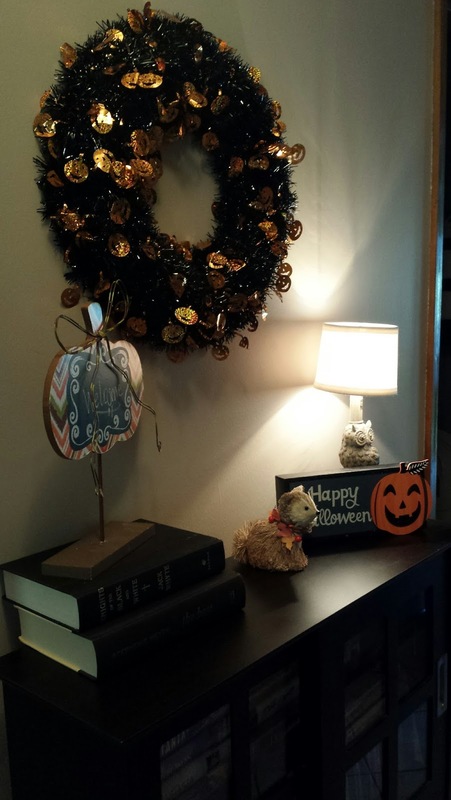 I try to keep the Halloween decorations minimal, just because my five year old freaks out at the mention of anything spooky. Mostly I use pumpkins, so I can keep it up until Thanksgiving. I call that efficient, not lazy...or at least that is what I tell myself! Here is my mantel. I wanted to show off all the pumpkins I have collected, and ALSO keep them out of the hands of my super cute (but grabby) two year old. This works! 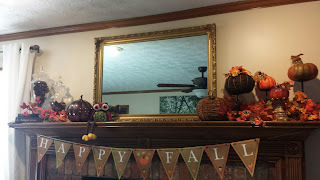 I don't tend to decorate too many surfaces because of the mentioned above two year old, but I do decorate our entry way. I found the Halloween wreath and sign for SUPER cheap last year at Walgreens after Halloween. I think I paid maybe $5 for both. I love shopping after the sales- best time to stock up! I am so sorry about the picture quality- time for a new camera I think! LOL! 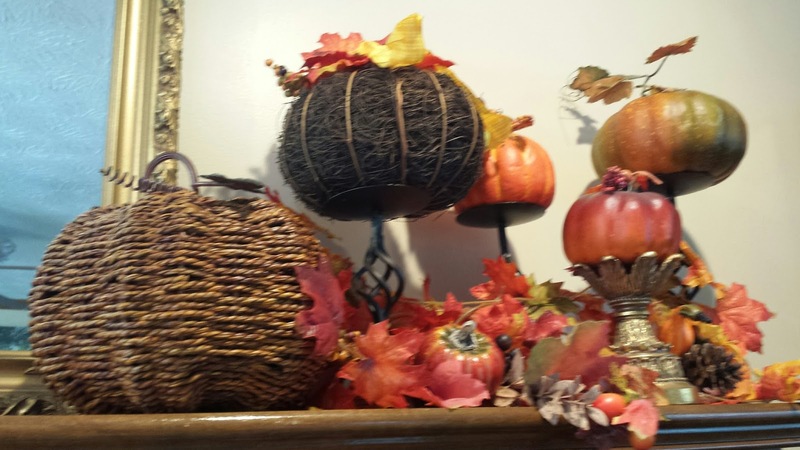 Something about the fall brings out my creative side and makes me want to create things! I tend to make lots and lots of freebies and materials. You can see a snapshot of my fall freebies here. Click on the picture to get them all! 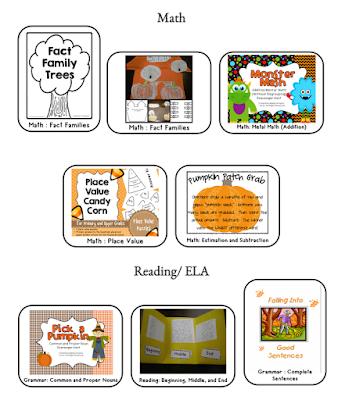 I create a fall freebie JUST for this blog post. I did an entire monster unit in second and third grade that my kids LOVED. This is just a piece of the unit. This piece is most likely appropriate for 1st- 2nd. However, you could adapt it for third without all the support and time. It is a two-three day ELA lesson using the book Go Away Big Green Monster by Emberley! Love that book! Don't forget to enter the giveaway for a $50 giftcard to Amazon OR TpT - winners choice!!! Today is the LAST day to enter this give away before a one one starts tomorrow! !